Our beloved cloud names sport valuations in the 20's and even 30's. This is where the largest profits are. One sector where we did see some major selling pressure yesterday was in Information Technology. Selling continued across the semiconductor space, which is highly exposed to China for revenue. However, the selling was just as intense for the cloud/software space, an industry almost entirely not exposed to China, but perhaps just as exposed to the ruthless magic of passive investment. Depending on your source, the technology sector trades at a higher valuation than does the broader marketplace, at somewhere between 18.7 times and 19 times next year's earnings. Sliced and diced, one quickly sees the semis, and their suppliers trading around 10 to 13 times, while our beloved cloud names sport valuations in the 20's and even 30's. This is where the perceived overvaluation is. This is where the largest profits are, this is where the money has to come from for those getting skittish ahead of any feared slowdown in growth. Truth be told, as a trader, I added to my cloud longs as the closing bell rang last night, or at least the ones not trading prohibitively above my net basis at this point. Interestingly, one name jumped out at me after the closing bell... a name that I am already long... for a good while... Microsoft (MSFT - Get Report) . Microsoft gave up a little more than 1% on Monday. Ugly? Yes, but still outperforming the Nasdaq Composite, the Information Technology sector, and the software industry. Hmm. What goes on here? 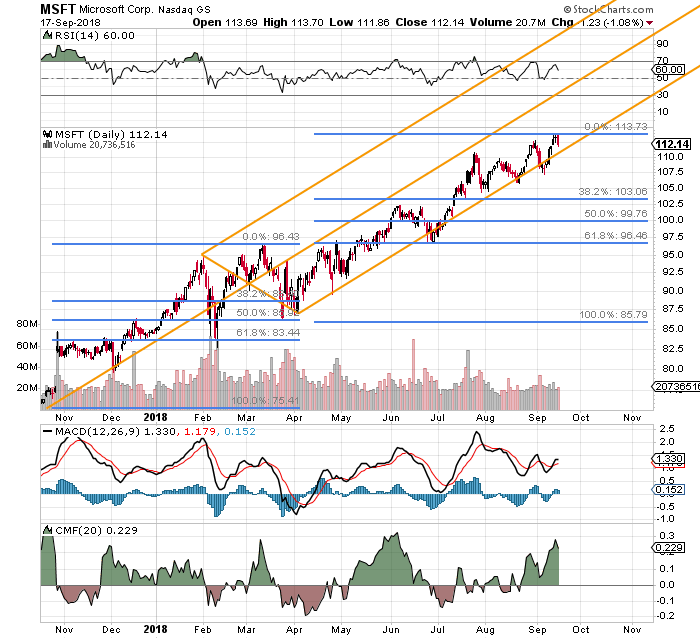 Apparently, Five-star Stifel analyst Brad Reback pointed out late in yesterday's regular trading session that Microsoft has announced an increase to the firm's dividend payment on the third Tuesday of September for eight consecutive Septembers. Microsoft has already made plain the firm's intent to return a cool $20 billion to shareholders. Reback placed a price target of $118 on this name. Same day, Oppenheimer analyst Timothy Horan, also five-star caliber... maintained his buy rating on the name, and established a $127 price target. MSFT trades at something close to 26 times forward looking earnings, expensive for the broader marketplace, but not for the group. Cash on hand and cash equivalents dwarf total debt. Operating Margin is healthy and growing. Cash Flows are enormous. Current and Quick Ratios are robust. On September 24th-28th (next week), Microsoft will be hosting the Ignite conference in Orlando. The focus here will likely be on Cloud technology, as well as on new innovations across the Microsoft universe involving big data, and artificial intelligence. Wait... there's more. By the way, the firm will hold it's "Apple (AAPL - Get Report) style fall product launch event in New York City on October 2nd. (That's in two weeks). Think hardware such as a new Surface in addition to new software. I think that maybe the stock price increases in front of these events as we saw with Apple? Maybe. I'm long the name. I am not always right, but I do not see the current week as good timing for a sale. One thing that a chart watcher might say is that this is one heck of a nice Pitchfork. Money Flow is strong. Every component of the daily MACD is pulling the right way. Relative Strength is at a nice level, but appears to be waning just a bit. I placed the second set of Fibonacci levels on the chart just so that the investor my be able to place an effective panic point somewhere. That somewhere for me is the $103 level. However, the stock continues to make higher highs while also putting higher lows to the tape. I interviewed a CEO in an unrelated field for an unrelated purpose the other day. That executive told me that his firm uses the Microsoft Azure cloud for it's business. That did not surprise at all. Note: MSFT reports on October 18th. For those looking to scalp some revenue by selling the October 19th 105 puts, they only paid 64 cents last night. Is that worth it? Only you can answer that. However, the November 16th 105 puts went out paying $1.64. An extra hundred buck per contract for an extra month of exposed risk? That one's a definite maybe from my corner.